Elijah, the mighty prophet of God, lying under a broom tree and wishing to die? How did this happen? Elijah was an influential prophet. His name means “Jehovah is my God.” Wasn’t this the same Elijah God had used to overthrow the prophets of Baal in a great victory? Yes. But when Jezebel heard that her prophets had been killed, she sent out word that she was going to kill Elijah. And Elijah fled. From spiritual victory to deep depression. If a mighty prophet of God can get depressed, so can we. When the Bible first mentions Elijah in 1 Kings 17, he simply shows up and confronts King Ahab. Proverbs 28:1 says the righteous are as bold as a lion. Elijah certainly was. Ahab had been worshipping Baal and encouraging the people of Israel to worship Baal, too. One of the things Baal supposedly controlled was the weather. Elijah’s pronouncement was a direct challenge to Baal. Elijah told Ahab it would not rain except at Elijah’s word. James 5:17 says it was because Elijah prayed that it didn’t rain. Then God hid Elijah from Ahab. After three and a half years, Elijah showed up again. This time he challenged the prophets of Baal to a contest to prove which god was the real God. The challenge was that the prophets of Baal would offer a sacrifice to their god and Elijah would offer a sacrifice to the living God. The god who answered with fire would be the true God. Elijah let the prophets go first. They cried out to Baal all day. Nothing happened. Then Elijah built an altar out of 12 stones and had 12 large jars of water poured over it. He prayed a simple prayer and God responded with fire from Heaven. Elijah gave the word and the prophets of Baal were put to death. Then Elijah told Ahab it was going to rain. Elijah prayed earnestly for rain—seven times—and God answered his prayer. In the strength of the Lord Elijah ran from Mount Carmel to Jezreel. On the way, he passed Ahab’s chariot. But when Ahab told Jezebel what had happened on Mount Carmel, she became so angry that she sent a messenger to Elijah saying, “May the gods deal with me, be it ever so severely, if by this time tomorrow I do not make your life like that of one of them” (1 Kings 19:2). Elijah ran again, this time to the desert. That’s where he ended up under a broom tree wishing to die. How Did God Treat Elijah? Sometimes after a great spiritual victory, we are vulnerable to depression. Our spiritual adrenaline wears off, leaving us exhausted and worn out. This is what happened to Elijah. He was physically exhausted from running. He was emotionally exhausted from learning that Jezebel was trying to kill him. He was spiritually exhausted from his day on Mount Carmel with the prophets of Baal. So how did God treat Elijah? Did he tell him to snap out of it? To stop feeling sorry for himself? No. Twice God sent an angel to minister to Elijah’s physical needs. God fed Elijah and made him rest. We need to take care of our tired bodies, our tired minds, and our tired spirits. After Elijah ate and slept, he went to Mount Horeb. Why Mount Horeb? Perhaps because Mount Horeb is another name for Mount Sinai. 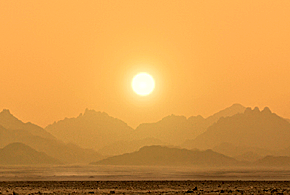 Elijah knew God had revealed himself to Moses on Mount Sinai. Perhaps Elijah wanted to go where God revealed himself. But when Elijah got to Mount Horeb, he went into a cave there. He was still depressed. Did God chastise Elijah? No. God put Elijah in a place where he could show him his power. The Lord said, ‘Go out and stand on the mountain in the presence of the Lord, for the Lord is about to pass by.’ Then a great and powerful wind tore the mountains apart and shattered the rocks before the Lord, but the Lord was not in the wind. After the wind there was an earthquake, but the Lord was not in the earthquake. After the earthquake came a fire, but the Lord was not in the fire. And after the fire came a gentle whisper (1 Kings 19:11-13). Like Elijah, we need to look beyond the mighty winds that buffet us, beyond the fires that surround us, beyond the earthquakes that toss us about to listen to the still small voice of God. When we expect God to give us a flashy display we often miss the message. God said, “What are you doing here, Elijah?” Elijah’s reply was, “I have been very zealous for the Lord God Almighty. The Israelites have rejected your covenant, broken down your altars, and put your prophets to death with the sword. I am the only one left, and now they are trying to kill me too” (1 Kings 19:14). Depression comes when we take our eye of faith off our Father and turn it inward. Then God told Elijah the best thing anyone can hear—the thing we all need to know: you’re not alone. “Yet I reserve seven thousand in Israel—all whose knees have not bowed down to Baal and all whose mouths have not kissed him” (v. 18). We’re not alone. We have our church family. We can turn to them for support and spiritual strength. After God comforted Elijah and took care of his physical needs, he gave Elijah a practical remedy for his depression—he gave Elijah a mission. He sent Elijah back among people so Elijah wouldn’t isolate himself. Helping someone else takes our minds off our own troubles. Having a purpose focuses us. Elijah’s story reminds us that even great men are human. Sometimes when we get depressed we feel guilty because we think Christians shouldn’t get depressed. That’s faulty reasoning. Christians get depressed. That’s a fact. The way to deal with it is not by feeling guilty about it or by feeling sorry for ourselves, like Elijah did at first. If we’re busy worrying about the wind, the fire, and the earthquake, we may miss the still small voice. God’s still small voice is always there. We must not let our circumstances drown it out. So what do we do? We turn to God for his comfort and advice. We go to where God reveals himself to us—in his Word. The remedy for depression lies in resting, eating, seeking God, reminding ourselves of his awesome power, realizing we are not alone, and looking for ways to help others. We must be careful not to shut ourselves off from other people. Being alone only magnifies our problems. Whether depressed or joyful, we are always wise to help others. Helping others blesses us and it blesses them. Counting our blessings can help us focus on God’s goodness; but we should also share them. That way others can focus on God’s goodness, too. Doing God’s will—getting busy, serving others, furthering his kingdom—also takes our focus off our depressing circumstances and helps us focus on our purpose for being here. We are to be doers of God’s Word. Ephesians 5:19 says we are to speak to one another in psalms, hymns, and spiritual songs. Music can inspire and uplift us. Therefore humble yourselves [demote, lower yourselves in your own estimation] under the mighty hand of God, that in due time he may exalt you. Casting the whole of your care [all your anxieties, all your worries, all your concerns, once and for all] on Him; for He cares for you affectionately, and cares about you watchfully. God’s voice speaks powerfully to us though the Scriptures, but in times of depression, even Scripture may seem hollow and meaningless. Here are some ways to help God’s voice penetrate the darkness. • If you have friends or family members who are depressed, write out a Scripture verse for them. Your handwriting may provide a sense of intimacy and urgency. • If you’re depressed, write, speak, and read a verse over and over. Tell God when it feels hollow and ask him to bring a fullness you can experience. • Give the Word time to work. The right verse won’t likely overcome feelings of depression in an instant, but over time it can sink in and bring new life. Previous StoryIs depression good for the soul?